During Sandy, we lost power for 5 days along with the rest of Lower Manhattan. We were very fortunate that our water did not stop running during the storm and that we are close enough to Midtown that we were able to get out and get charged everyday. Eli, Harley and I are very thankful. I went to work only a little bit during the aftermath of the storm, and spent most of my time working on my Peabody. The first night of the blackout I made the mistake of trying to do the large lace panel by candlelight. Big Mistake. The next day I had to spend some time finding and correcting my mistakes. The sleeves, however, made great candlelight knitting so I ended up knitting the body for as long as I could and then when the sun got too low in the sky I would switch to the sleeves. Later, once power was restored this was still my "Sandy" project and it accompanied me to the Park Slope Armory where I helped those displaced by the storm relax in a nightly knitting circle. I wish I could have been able to attend more often, but the few nights I spent there were a mixture of sadness and cheer in equal measure. Now, in early December, my sweater is almost complete. 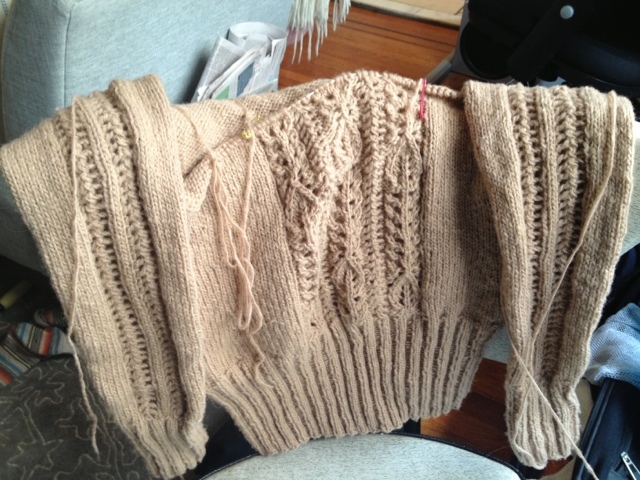 The sleeves are blocking and I am a few inches away from completing the body (picture taken pre-blocking). I love this sweater. I love the way the yarn has knit up, it's slightly pilly, rustic texture, and I loved knitting this pattern. It's easy to forget how much suffering was going on while I sat in a heated Midtown office with my knitting, or played board-games by candlelight. Eli and I are prepared for the eventuality of another blackout, we know it will happen, maybe even every year. I just hope that we can make sure the rest of the city is prepared. Too much is at stake. We must not forget. I'll try to think of it whenever I put this on.